Competition has long been revered, at least in our capitalistic society. The mere mention of the word has been known to bring tears to the eyes of captains of industry and athletes, among others. Many believe that whatever we have that is of value we owe to the blessings of competition. What is methodically overlooked, however, is the cooperation that inevitably accompanies all competition. Certainly the purest form of competition is war. Yet even in war there is cooperation between enemies. They must agree to show up on the same battlefield or they cannot fight (“What if they threw a war and nobody came?”). Armies in the field must cooperate with one another in order to fight. Then there is the Geneva Convention, the Code of Conduct, Rules of Engagement, and other sets of agreements too numerous to mention. So even in the most sacred forms of competition, cooperation is utterly indispensable. The interesting thing is that you cannot have competition without cooperation, but you can have cooperation without competition. That is, in fact, one of the singular features of the Internet: it is based on cooperation rather than competition. Don’t think me so naive as to believe that there is nothing competitive going on in cyberspace. Far from it. But that competition is part of the content, not an element of its defining nature. And since the Internet is something of a prototype for the new reality that is now emerging, it is a good model to follow in adapting to our own future. If it works on the net, it can probably be adapted to human life offline. What we value most is gained through cooperation. The more cooperative you are, the better your life works. It has long been assumed that competitiveness is an essential component of human nature, but we seldom hear about man’s inherent cooperativeness. Yet in cyberspace, the most unrestricted playing field in history, this is the quality that has risen to the surface. The Internet literally owes its existence to cooperation freely given. No where else can you find so much freely offered. Everywhere you look, you find free information, free services, free speech, free art, free, free, free…. Cooperation is monumentally cheaper than competition as a means to accomplishing common goals. Perhaps best of all, in matters of cooperation, everyone wins. This is in stark contrast to most forms of competition where someone is assured of losing. Competition is the archetypal “zero-sum game.” In case you’re not familiar with the term, a brief description is in order. The so-called zero-sum game (for more on this look here) is one in which everything won by one player must be lost by others. In other words, for me to win $1, my competitors must collectively lose exactly $1. This is what is referred to variously as “the law of the jungle,” or “kill or be killed,” or “it’s a dog eat dog world.” But what if it’s really a dog-eat-dog food world? What if competition is a fool’s paradise? People like to be cooperative. It feels good. The results are better for everyone. It is as efficient as it is effective. To choose competition over cooperation is, as Mark Twain once put it, “like preferring a watch that must go wrong over one that can’t.” In the popular vernacular, it’s a no-brainer. You may be asking, “What do I do about people who are still determined to be competitive?” Good question. The first answer may simply be to avoid them whenever you can. They want to win, which means that for them to get what they want you have to lose an equivalent amount. If you think that’s the only way for you to gain your ends, then you’re already one of them. If, on the other hand, you want to gain your ends, but do so in ways that don’t involve the zero-sum game, then you will have to learn a whole new way of interacting, one based on cooperation. The good news is that there are many examples out there upon which to base your approach. 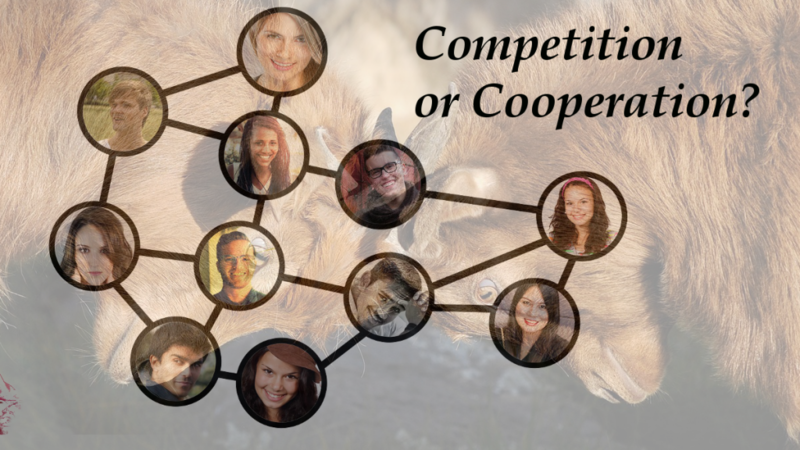 To get a quick sampling, just Google “cooperation over competition.” There is an ongoing, and sometimes heated, debate on the subject. Basically, the notion that we have to kill or be killed is a carryover from days long gone when there was more than a shred of truth in the assertion. But as it turns out, even in dire circumstances, cooperation can provide a better solution. Even our most ancient ancestors were better hunters in coordinated groups that shared their bounty than they were as single hunters who hoarded their game. You may be closer to embracing this approach than you think. Teamwork is, for example, a time-honored strategy. What limits it, as it is usually practiced, is that it is applied only to one’s team and not to the “enemy.” To give this form of cooperation broader application, all you have to do is expand your definition of your team to include everyone. Now you can apply everything you know about teamwork to any scale you choose. “But,” you may say, “if I include my competitors on my team, they have goals that are contradictory to my own.” That may be true. But on how many traditional teams does everyone agree all the time? Yet they seem to work well enough. So clearly differences of opinion or purpose can be tolerated, and even merged to mutual satisfaction. The key lies in the basic good intent of the team members. Competition puts individuals or groups against one another toe-to-toe in a zero-sum game. Cooperation places them shoulder-to-shoulder and side-by-side toward a common goal or obstacle with the intent that everyone wins. This image of toe-to-toe versus shoulder-to-shoulder is an excellent one to actually feel the difference between competition and cooperation. To meet this challenge in the new century we have to take stock of our most frequently used styles of interacting and conducting transactions. Which of these two stances do we adopt most often? Do our toes touch, or our shoulders? If you find yourself choosing the former, what can you do to change that? How might that work better? Take it slow if you must, but keep at it. Sooner or later, it will work its wonders on you and those closest to you.